The work of ADP in Ghana has focused on strengthening components of the health system by linking policy goals with interventions to strengthen institutions and build technical skills. ADP contributed to addressing key policy gaps within the health sector through the formulation of the National Medicines Policy (NMP) and the National Health Research Agenda, which provide policy and strategic guidance on promoting access to health technologies and addressing bottlenecks to their introduction and scale up. In promoting an integrated approach, ADP worked with stakeholders to provide the needed technical support and capacity building interventions to ensure that core functions within the regulatory and safety monitoring systems, disease control, and supply chain management were strengthened. Since the earliest stages of the project, ADP has served as a primary partner of the Ministry of Health (MOH) in establishing a multisectoral forum to promote policy and regulatory coherence for access and delivery of new health technologies. A key outcome of ADP support was the development of the NMP 3rd edition in 2017. The NMP, adopted by the Cabinet in May 2018, aims to fill an existing policy gap by setting out updated policy guidance for the governance and regulatory control of the pharmaceutical sector. The NMP is critical for the support of coordinated action across sectors and ensuring the quicker introduction and uptake of new health technologies. ADP also partnered with the Research and Development Directorate of the Ghana Health Service to formulate the National Health Research Agenda 2015–2019. The agenda provides a systematic framework and action plan to prioritize efforts and resources for research to address bottlenecks within the TB, malaria and NTD control programmes. 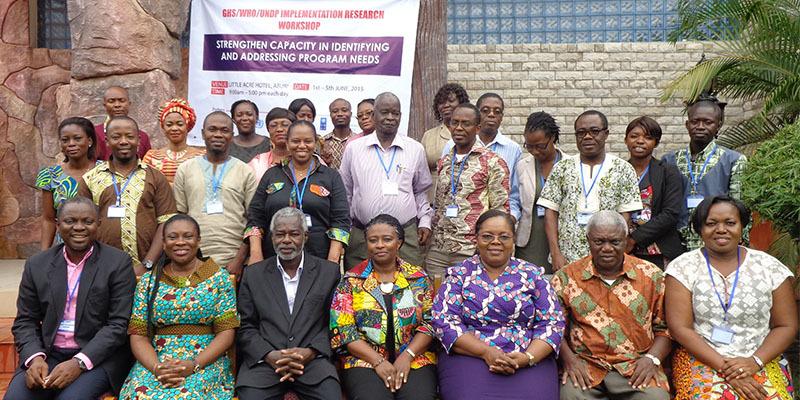 ADP support has strengthened national research capacity together with a cohort of health researchers and programme implementers in the country’s health research centres across all 10 regions in Ghana. ADP has also supported the capacity of the researchers to raise external research funding, which was successfully raised from the Global Fund to Fight AIDS, Tuberculosis and Malaria and the Department of International Development of the United Kingdom to investigate key priorities. Until recently, the Ghana Food and Drug Administration (FDA) had no individual case safety report management system for pre- and post-approval safety data. Low reporting rates, coupled with a lack of doctors trained in drug safety monitoring, translated into inadequate management of safety reporting.9 ADP provided critical support to the introduction of a new and effective approach for drug safety monitoring. This support included the piloting and roll out of a national electronic management system for pre- and postapproval safety monitoring of health technologies, known as the ‘Safety Watch’ system, which was designed to incorporate patient/consumer reporting portals and reports from clinical trial sites. ADP also supported the training of almost 1,000 health service staff across the country to ensure its effective use. As a result, the Ghana FDA is now able to monitor effectively the safety of new health technologies, including the new malaria vaccine that is being piloted in the country. As coverage of the National Health Insurance Scheme (NHIS) expands towards UHC, national capacity and technical expertise for the prioritization and economic evaluation of new health technologies grows in importance. Since 2014, ADP has provided support to strengthen the institutional and individual capacities within the MOH, and at major universities and research institutes on the use of HTA. This support enables evidence-based prioritization of services and health technologies covered under the NHIS and informs price negotiations in medicines procurement and other related cost containment measures. A pilot initiative, jointly undertaken by the MOH, Priority Cost-Effective Lessons for System Strengthening (PRICELESS), International Decision Support Initiative (iDSI) and ADP, to review the standard treatment guidelines (STGs) for hypertension as a ‘tracer’ condition, has found the potential for significant health improvements and cost savings (of up to an estimated US$14 million) if treatment regimens were changed to use better value first-line medicines.10 ADP will continue to support the MOH to expand the use of HTA in decision-making for a wider range of diseases and products, including TB, malaria and NTDs, with the aim of fostering informed decision-making and policy change. Finally, mass drug administration (MDA) campaigns for NTDs were identified as an important opportunity for improvements in logistics management. Critical capacity gaps were identified within the national NTD control programme, as a result of lack of documented protocols and training curricula for health workers. ADP helped establish a national logistics capacity-strengthening curriculum and associated materials, and also established a cadre of trainers to support sustained training on NTD MDA supply logistics management. The development of standard operating procedures and guidelines, as well as training will be rolled out in the next phase of ADP. This will contribute to the more efficient use of quality-assured medicines and increased availability for the 25 million people of Ghana, who are still at risk from at least two of the five most prevalent NTDs (namely, lymphatic filariasis, onchocerciasis, soil-transmitted helminthiases, schistosomiasis and trachoma). 9Ministry of Health, Ghana (2014). Health Sector Medium Term Development Plan 2014–2017. 10Sabblah GT, Akweongo P, Darko D, Dodoo AN, Sulley AM (2014). Adverse drug reaction reporting by doctors in a developing country: A case study from Ghana. Ghana Medical Journal 48(4):189–193 10 iDSI (2017). Improving the quality and efficiency of healthcare services in Ghana through HTA. All data from 2017 unless stated. PC: preventive chemotherapy; STH: soil-transmitted helminths; LF: lymphatic filariasis; SCH: schistosomiasis; OCH: onchocerciasis. UNDP, ‘International Human Development Indicators’ (website), UNDP, New York. Accessed 24 September 2018. Global Health Observatory, ‘Tuberculosis country profiles’ (website), WHO, Geneva. Accessed on 24 September 2018. Global Health Observatory, ‘Malaria country profiles’ (website), WHO, Geneva. Accessed on 24 September 2018. Preventive Chemotherapy (PC) Data Portal (website), WHO, Geneva. Accessed on 24 September 2018.